I don’t know about you but we’re in full-on summer camp mode around here which means the daily lunches haven’t stopped for this mama. Now that the Farmers’ Markets have opened and fresh local produce has arrived, it’s been so easy to support local farmers in and around the city. We’ve been making a concerted effort to shop and support local as much as possible. Imagine my surprise and delight when I found out that GLAD (maker of everyday household items – garbage, recycling and compostable bags) is not only a manufactured in Canada but located right in our backyard in the town of Orangeville. 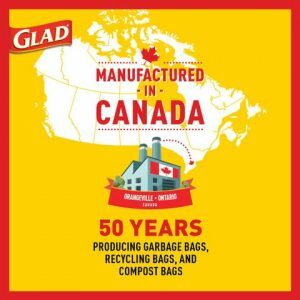 Did you know that the GLAD plant in Orangeville has been making everyday household items – garbage, recycling and compostable bags for over 50 years? With recent discussions of tariffs on consumer goods it’s good to know that products we know and love are made right here so close to home. I am very proudly Canadian and shopping with companies who make and manufacture goods here is one way to support our Canadian economy and increase jobs nationwide. The GLAD plant in Orangeville employs 120 Canadians and has donated more than $168,000 both corporately and through employee-led causes. GLAD employees, part of Clorox Company of Canada, can give through payroll deductions and the company will match that amount to a registered charity of the employee’s choice. Something else that may surprise you is that the origin of the garbage bag dates back to 1950 by Canadian inventors Harry Wasylyk and Larry Hansen. Union Carbide Company bought the idea in the 1960s and began manufacturing the product for household use under the name GLAD trash bags. One of the things I love most about GLAD is their commitment to innovation. Recently, the Orangeville factory doubled capacity for its compostable bags manufacturing line. The goal is to ensure that fewer items end up in our landfills all while supporting recycling programs. I love knowing that products I use are helping our Canadian economy so join us in supporting our local buddies when you make your next purchase! «Celebrating Summer – Mommy Connections Style! Good to know. Although I try to minimize my use of plastic. I use a saucer or luncheon plate and store in glass bowls whenever possible. I do buy local whenever possible.